Could China-US deal be dotted before G20? Chinese Vice-Premier Liu He will engage this week in a new round of trade talks with the Trump team in Washington. While a deal is still by no means ‘in the bag’, there are growing incentives for both sides to cut an agreement at or before June’s G20. President Donald Trump said Friday that last week’s US-China talks in Beijing went “very well” and that “probably one way or the other we’re going to know over the next three to four weeks” with both sides poring over a reportedly 150-page document they are working on which he said will be an “great” agreement. So this could potentially mean a conclusion before June’s G20, and a Trump-Xi meeting in April or May given that the US president has a penchant for ego-boosting summits and is known to ideally want to seal any deal face to face with his Chinese counterpart. The most recent stimulus for a positive conclusion of trade negotiations is the Mueller report’s conclusion which is perceived in many world capitals to have placed Trump in a stronger domestic political position. With the charge of ‘collusion’ with Russia (but not ‘obstruction of justice’) apparently found wanting, the report is neither the complete vindication for Trump that the White House suggests, nor the worst-case scenario either. In this context, the billionaire’s prospects of winning a second term are widely seen in Beijing to have risen, thereby providing more incentives for Chinese policymakers to double down now in the trade negotiations. The formal conclusion of the Mueller report also gives the president more potential political space to focus squarely on 2020 and seeking in coming months to try to fulfil his ‘Make America Great Again’ agenda. This programme includes seeking to reduce the US global trade deficit and cracking down on trade practices perceived to be unfair. The Trump White House still has Beijing squarely in its sights here as signified, for instance, by the signing of legislation last year requiring the US Commerce Secretary to deliver a ‘Report on Chinese Investment’ in the United States to Congress and the Committee on Foreign Investment in the United States every two years up to 2026. The bill singles out Chinese investment as a security threat and zeroes in on Beijing’s ‘Made in China 2015’ plan. So much so in fact that some in Beijing perceive the new US legislation is just the latest part of a wider, grand strategy under Trump to thwart the nation’s rise as a global superpower. This sentiment underlines that, while hopes of a trade deal are rising again, bilateral tensions have by no means disappeared and still have the potential to severely disrupt what is probably the world’s most important economic and political bilateral relationship. It is important to note here too that Trump is also under political pressure from some Democrats over the terms of any trade deal.Take the example of Senate Minority Leader Chuck Schumer who said last week that Trump should not “back down” and take a deal based largely on Beijing’s purchases of US soyabeans and other goods. The long-time China hawk, now one of the most powerful Democrats in the nation, also tweeted that “Now’s not the time to drop $200 billion in tariffs just because China’s close to a deal”. All of these factors, alongside the complexity of the agreement currently being negotiated, is one reason why progress has dragged after Trump had set a tentative deadline of end-March to try to reach a deal. And in this still uncertain context, Xi is unlikely to want to travel to the United States for (or host in China) a high stakes foreign summit with Trump unless a deal is more or less completely brokered beforehand. This is especially so after the US-North Korea summit in Vietnam, which ended in a diplomatic disaster — after months of painstaking negotiations that were expected to yield a deal — when Trump “walked” out from talks with Kim Jong-un.The mercurial nature of the US president is widely recognised in Beijing as a relevant factor in any negotiation end-game as, while economic and security fundamentals will largely determine the course of ties in coming years, personal warmth between the two leaders could also be key as was the case during the Obama years. Should talks break down in coming weeks, despite the presently positive mood music, Beijing will know there remains the possibility that Trump’s rhetoric will get very hostile again, as during much of 2016 and 2017. He has previously asserted that “China... has been very tough on our country... We probably lost last year 500 billion US dollars in trade to China”. And it is this narrative that Trump may yet return to this year if he judges it again in his political interests. Taken overall, both sides now have growing incentives to conclude a trade deal this Spring. 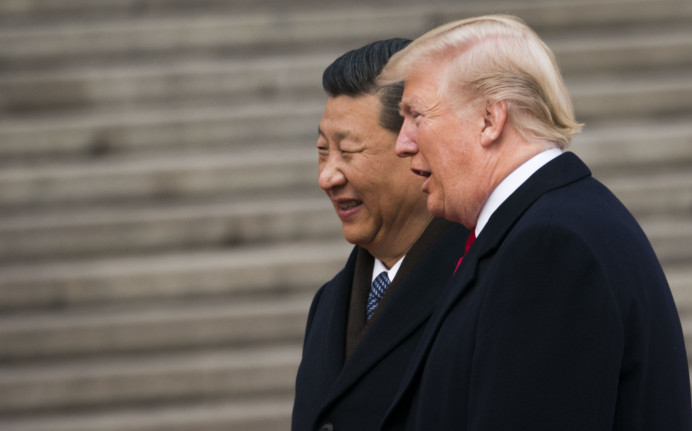 However, talks could yet break down again as soon as April and any final breakthrough may require the personal intervention of Trump and Xi at the G20, or a special summit beforehand in China or the United States.